Our Gospel reading today contains Jesus’ second prediction of his passion and death (the first was in last week’s reading). As before, the disciples are stunned at the disclosure—they are uncomprehending. Proverbs ends with an acrostic poem—each line in the Hebrew text begins with a subsequent letter of the Hebrew alphabet. The poem parallels the poems praising Wisdom in chapters 1—9, although here the figure of Wisdom is transformed into an earthly wife. It is, of course, a highly idealistic vision; no woman could meet all these expectations. Nevertheless, the poem provides a sense of what it means to live in the way of Wisdom. 31:10 A capable wife who can find? She is far more precious than jewels. 11 The heart of her husband trusts in her, and he will have no lack of gain. 12 She does him good, and not harm, all the days of her life. 13 She seeks wool and flax, and works with willing hands. 14 She is like the ships of the merchant, she brings her food from far away. 15 She rises while it is still night and provides food for her household and tasks for her servant-girls. 16 She considers a field and buys it; with the fruit of her hands she plants a vineyard. 17 She girds herself with strength, and makes her arms strong. 18 She perceives that her merchandise is profitable. Her lamp does not go out at night. 19 She puts her hands to the distaff, and her hands hold the spindle. 20 She opens her hand to the poor, and reaches out her hands to the needy. 21 She is not afraid for her household when it snows, for all her household are clothed in crimson. 22 She makes herself coverings; her clothing is fine linen and purple. 23 Her husband is known in the city gates, taking his seat among the elders of the land. 24 She makes linen garments and sells them; she supplies the merchant with sashes. 25 Strength and dignity are her clothing, and she laughs at the time to come. 26 She opens her mouth with wisdom, and the teaching of kindness is on her tongue. 27 She looks well to the ways of her household, and does not eat the bread of idleness. 28 Her children rise up and call her happy; her husband too, and he praises her: 29 “Many women have done excellently, but you surpass them all.” 30 Charm is deceitful, and beauty is vain, but a woman who fears the Lord is to be praised. 31 Give her a share in the fruit of her hands, and let her works praise her in the city gates. The Book of Psalms begins with a poem from the wisdom tradition, which typically portrays a simple division between the way of the righteous/wise with the way of the unrighteous/sinners. The former are under the protection of God, the latter like useless chaff that the wind blows away. These three verses begin a longer passage (through 12:6) in which the prophet laments his discovery that there is an assassination plot against him. As the passage goes on we learn that the plotters have been identified by Jeremiah as false prophets and/or priests. 11:18 It was the Lord who made it known to me, and I knew; then you showed me their evil deeds. 19 But I was like a gentle lamb led to the slaughter. And I did not know it was against me that they devised schemes, saying, “Let us destroy the tree with its fruit, let us cut him off from the land of the living, so that his name will no longer be remembered!” 20 But you, O Lord of hosts, who judge righteously, who try the heart and the mind, let me see your retribution upon them, for to you I have committed my cause. The Wisdom of Solomon is a book of the Apocrypha, that collection of books that we do not consider Scripture, but have set aside as edifying. Wisdom was probably written a century before Jesus’ birth. Our reading this morning is part of a larger reflection on the reward of the just and the punishment of the wicked, states determined by reliance upon wisdom or the spurning of it. The “ungodly” here believe death will save them from judgment and that the efforts of the righteous are futile. 1:16 The ungodly by their words and deeds summoned death; considering him a friend, they pined away and made a covenant with him, because they are fit to belong to his company. 2:1 For they reasoned unsoundly, saying to themselves, “Short and sorrowful is our life, and there is no remedy when a life comes to its end, and no one has been known to return from Hades. 12 Let us lie in wait for the righteous man, because he is inconvenient to us and opposes our actions; he reproaches us for sins against the law, and accuses us of sins against our training. 13 He professes to have knowledge of God, and calls himself a child of the Lord. 14 He became to us a reproof of our thoughts; 15 the very sight of him is a burden to us, because his manner of life is unlike that of others, and his ways are strange. 16 We are considered by him as something base, and he avoids our ways as unclean; he calls the last end of the righteous happy, and boasts that God is his father. 17 Let us see if his words are true, and let us test what will happen at the end of his life; 18 for if the righteous man is God’s child, he will help him, and will deliver him from the hand of his adversaries. 19 Let us test him with insult and torture, so that we may find out how gentle he is, and make trial of his forbearance. 20 Let us condemn him to a shameful death, for, according to what he says, he will be protected.” 21 Thus they reasoned, but they were led astray, for their wickedness blinded them, 22 and they did not know the secret purposes of God, nor hoped for the wages of holiness, nor discerned the prize for blameless souls. Psalm 54 begins as a lament of one feeling threatened by enemies of some kind. Like most psalms that begin in lament, it resolves into trust in the God of the covenant who is always faithful. in your might defend my cause. 3:13 Who is wise and understanding among you? Show by your good life that your works are done with gentleness born of wisdom. 14 But if you have bitter envy and selfish ambition in your hearts, do not be boastful and false to the truth. 15 Such wisdom does not come down from above, but is earthly, unspiritual, devilish. 16 For where there is envy and selfish ambition, there will also be disorder and wickedness of every kind. 17 But the wisdom from above is first pure, then peaceable, gentle, willing to yield, full of mercy and good fruits, without a trace of partiality or hypocrisy. 18 And a harvest of righteousness is sown in peace for those who make peace. 4:1 Those conflicts and disputes among you, where do they come from? Do they not come from your cravings that are at war within you? 2 You want something and do not have it; so you commit murder. And you covet something and cannot obtain it; so you engage in disputes and conflicts. You do not have, because you do not ask. 3 You ask and do not receive, because you ask wrongly, in order to spend what you get on your pleasures. 7 Submit yourselves therefore to God. Resist the devil, and he will flee from you. 8a Draw near to God, and he will draw near to you. Our Gospel reading today contains Jesus’ second prediction of his passion and death (the first was in last week’s reading). As before, the disciples are stunned at the disclosure—they are uncomprehending. They are comprehending of their social status, however, and argue about it with one another. 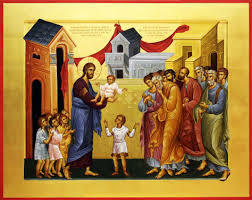 Jesus rebukes them by placing a child among them. This is who to emulate. The Scripture readings (except for the psalm) are from the New Revised Standard Version Bible, copyright © 1989 by the Division of Christian Education of the National Council of Churches of Christ in the U.S.A., and are used by permission. All rights reserved. The Psalm translation is from The Book of Common Prayer. Commentaries are copyright © 2018 Epiphany ESources, 67 E. Main St., Hornell, NY 14843. www.EpiphanyEsources.com. All rights reserved. Permission is given to copy for group study with this attribution. Bulletin inserts with these readings and commentaries are available by subscription. Visit our website for more information.